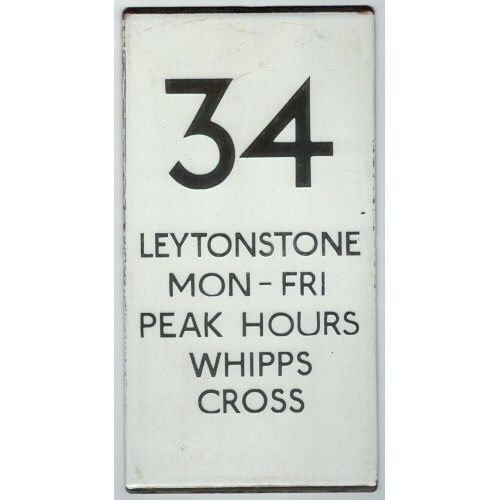 This auction is for an enamel London Transport Bus Stop double vertical e plate for Route 34 Leytonstone Mon-Fri peak hours Whipps Cross. It is approximately 130mm x 250mm and weighs around 500g. Route 34 ran between Barnet Church and Walthamstow Central via New Southgate, Palmers Green and Crooked Billet, extended at certain times to Leyton, Whipps Cross and Leytonstone (Green Man). This double vertical plate is likely to have come from Walthamstow Central Bus Station. It is in good condition with just some surface marks and edge wear (see photo).